This month’s Wine Blogging Wednesday post has me very excited. Not only does David McDuff’s Passion for Piedmont installment fit in perfectly with my February 28th Italian food and wine event, it has allowed me to get away from New World wines, and hopefully introduce some of my wine blog / wine vlog friends to Italian wines. While I have done a blog post or two about Italian wines, I’ve really never discussed Piedmont and it’s wines. 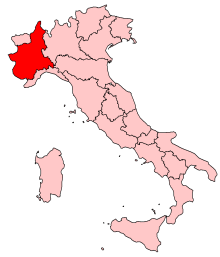 In the northwestern part of Italy, Piedmont is well known for it’s Barolo and Barbaresco wines, two of the world’s great reds. Made from the Nebbiolo grape, and carrying the DOCG designation, the wines are named for villages within the production zone. Gattinara and Gavi, which are made from the Nebbiolo and Cortese grapes respectively, also hail from Piedmont. Of course, you can also find other varieties of wine from Piedmont, and I’ll review a Langhe chardonnay later in the week. One could spend years tasting the various grape varietals in Italy, and I intend on doing that. However, for now, lets talk about Barolo. 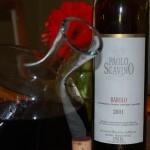 I had splurged, at least for me, on a Paolo Scavino 2001 Barolo, which cost a hefty $80 at the local big wine store. While I prefer to stay on the reasonable side for my wines, I decided to go all out and enjoy a great bottle of wine with Robin over the long holiday weekend. I actually picked the wine up before I knew about the WBW54 theme! I was also curious how this wine would compare to the $25 bottle of Barolo we’re using for the 2/28 event. With a little help from Giada, I decided to do a full on Italian food and wine pairing, making Osso Buco to pair with this wine. While I’ve discussed decanting red wines, for 30 to 60 minutes, and longer if necessary depending on the wine, Barolo (and Barbaresco) definitely requires some more decanting time. I figured 3 hours would be sufficient for this wine, and that was actually the recommendation for a sommelier friend of mine. 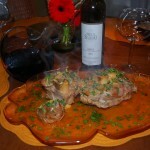 We used one of our favorite decanters, and let the wine breathe while Robin and I prepared the Osso Buco and roasted vegetables. Between the preparation, cooking time and plating, the wine had decanted for 3.5 hours, and we were ready to dig in to this awesome food and wine pairing. After three and a half hours of breathing, I really couldn’t get a ton on the nose. There was perhaps a bit of cherry, and some menthol or eucalyptus. I actually changed from the glasses pictured to a more tapered mouth just to see if perhaps the bouquet was there and it was avoiding me. However, the bouquet was the same, and I was a tad disappointed. However, I was bound and determined to enjoy the wine, and pressed on to the taste. The first taste of the wine was not exactly what I was hoping for. While very dry, as expected, the palate really did not wow me, at all. I had a different Barolo the week before, so the expectations were that the palate would be similar among the two. While full bodied and heavy like the previous Barolo, that is where the taste comparison ended. Other than an overwhelming taste of eucalyptus or menthol, there wasn’t a ton else going on here. No fruit, no vegetables, no earthy, organic, funky flavors. Just menthol. What a disappointment for a $80 bottle of wine. However, the Osso Buco was awesome, and the wine was open and there, so we continued on with our meal. We slowly ate the meal, really enjoying the meat and the veggies, and discussed various wine events we’ve got going on. All in all dinner took about 45 minutes, and then there was about 20 minutes or so of cleanup. Now, before you say “Matt, who gives a damn about you washing dishes?”, remember there’s a method to my madness. There was enough of the wine left in the decanter for 1 full glass, or two half glasses for both Robin and I. By now it had been decanting for over 4 and a half hours. While the bouquet didnt change much, the palate definitely did. Much smoother, and the menthol or eucalyptus was more or less gone. In it’s place, there was some cherry and fruit trying to make a showing, along with some pepper mixed in with the menthol on the finish. Robin and I both agreed we should have popped the cork early on this one, and it perhaps needed four and a half to five hours to decant. Also, it could have aged a little longer, maybe 2 years, maybe 22, before it needed to be drank. All in all the wine made a nice show at the end, and I would give it another go in perhaps a few years. I may procure a bottle, lay it down, and compare it in 2011. AS a closing note, I wonder if the 93 point rating Wine Spectator gave this wine, or the 95 point Wine Advocate gave it, affected the price tag much. Thanks again to David of McDuff’s Food & Wine Trail for this month’s theme, as well as Lenn Thompson at LennDevours for starting Wine Blogging Wednesday four years ago! Here’s to the next four years.